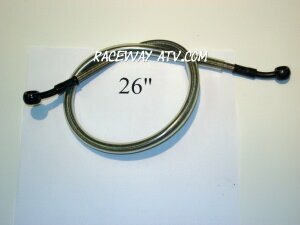 Raceway ATV carries a full line of replacement Kazuma, Roketa, Sunl, BMX, and Yamoto Chinese ATV Parts. If you do not see the Chinese ATV part you are looking for please call us at our toll free number 1-732-727-1579 or email us. Raceway ATV is one of the largest importers of Chinese ATV parts. If we do not have the part you are looking for most times we can place a special order for it. Standard shipping time on any part in stock is 3 to 5 days. If needed please call us for express shipping prices and details. Raceway ATV is your number one resource for Chinese ATV parts. We are an authorized distributor of Jetmoto and Kazuma ATV products. For all of your Chinese ATV's and parts shop with the best in the business Raceway ATV! Kazuma ATV And Motorcycle Parts for all units are AVAILABLE! Jetmoto ATV And Dirt Bike AVAILABLE! Redcat Motors And Tank ATV Parts AVAILABLE! Location of operation is in New York City (not just an internet Company) We are a full service mechanic shop for motorcycles, ATV's and accessories. Our clients feel good about dealing with us!